With its upcoming expansion, Battle for Azeroth, the world of Warcraft has never felt more tense. 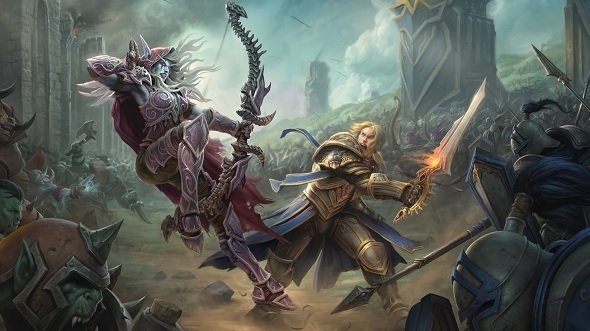 As players frantically finish off grinding their Legion reputations and fishing rewards before the expansion’s release on August 14, there’s a sense of eager anticipation as we get closer to finding out how on earth this almighty tussle between the Alliance and the Horde kicks off in the first place. In Battle for Azeroth, more is being done than ever before to give players an experience unique to their respective factions, with entire continents being locked to either the Horde or Alliance, and storylines exclusive to one side or the other. We spoke to World of Warcraft production director John Hight about the challenge of ensuring both sides have a worthwhile experience, how the studio is preparing players for the fight against each other, and why we should all be excited to join the fight. Can’t wait for August? Here’s 7 things you can do in World of Warcraft before Battle for Azeroth. At the end of Legion players were arguably closer than ever before as they fought a huge, common threat – why was the decision made to change the pace and pit players against one another? Well, I think you hit the nail on the head, it was that enemy that actually brought those factions together. It wasn’t as though they were heading to this wonderful kumbaya peace – there were tensions at the beginning of Legion. But the presence of the Legion itself was so potentially devastating for all of Azeroth, the factions just didn’t have time to explore what really happened – whether the Horde really betrayed the Alliance or not. Now that that big enemy has been defeated, I think the Alliance are returning to a point where they can explore that thinking of, ‘We felt betrayed, we lost our king’. 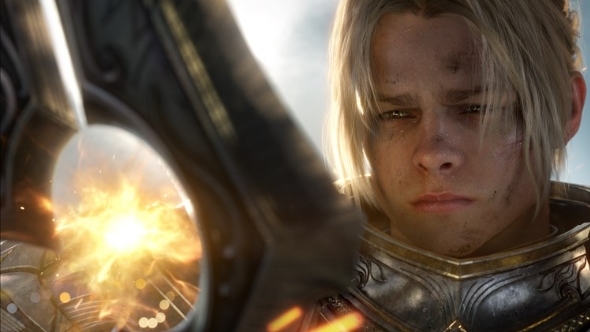 And, of course, Anduin is coming into his own as a young man – he certainly misses the presence of his father, but he recognises his responsibility as king, and one of the first things on his mind is to get some redemption for what happened. Was it always the plan to switch things up so dramatically? We typically plan our story arc two or three expansions ahead, so we know what characters we want to introduce and how we want to evolve them over the course of a single expansion, or even multiple expansions. So that’s something we considered very early on – when you have the big singular evil that you have to defeat, where do you go from there? We thought it would be appropriate and very interesting to say that the biggest threat now in Azeroth is each other. Can we, without that uniting threat of the Burning Legion, come together – or are we going to battle each other? And as you can see in Battle for Azeroth, we’re going to fight it out. What’s the reaction from players been so far? Well first off, we haven’t told anyone how this expansion’s going to end, so don’t make too many assumptions! It’s fun to speculate but we’re not going to tell you what’s going to happen until the last update to the expansion occurs. We have plenty of interesting and exciting twists and turns in store for you. But I think in general the reception has been pretty good. It’s funny, we plan out these stories and we bring in the team in groups in the early stages and run them through the story and talk about the features we’d like to do in the expansion so we’re all on the same page. I think the team at first were a little unsure about where we were going. We had a lot of, ‘So it’s going to be Horde vs Alliance again?’. They were concerned that everyone would think that the whole game had become PvP. We had to make it clear that no, it’s really going to be about the conflict itself. And the fun part is that we’re telling two completely different storylines. In Legion, you had the choice to go to whatever levelling zone you wanted, but whether you were Horde or Alliance you experienced a lot of the same content, and the majority of the content was designed so that it could be played by either faction. But in Battle for Azeroth, there are distinct storylines for the Horde and for the Alliance. Has it been tricky to convince players that isn’t just a PvP expansion? I don’t think so. I think the cinematic that the team produced really tells you the potential of what this game could be. When we showed that at Blizzcon and the cheers went up, I think everyone really kind of got it. For me, when I first saw that, even just the storyboards, I thought, ‘Man, now I get it, now I can see what the potential of this story could be’. But I think overall, it’s been a positive reception. I don’t get a lot by people saying the battle between factions is a bad idea, I think people are fairly excited. 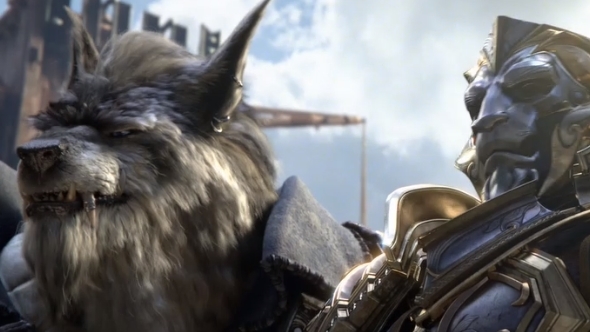 It does hark back to the early days of WoW, and even Warcraft itself. A lot of these stories were told through that lens, so I know people are going to be excited when they get to play the game. Even the sceptics are going to find that this was a pretty good creative choice. How do you go about preparing players for the coming clash? Well, a lot of it depends on how people play the game. It’s obvious in PvP, but in terms of the levelling up and the questing experience, this is why we really wanted to tell these two separate stories. There’s a point whether you’re on the Horde or the Alliance side where you begin an exploration into the other faction’s continent, and that can be pretty scary. It tells you a lot about what they’re up to and who they are – you’re not seen as an ally at all – and it’ll evoke that feeling of not being in a safe space. And that was a bit to take away from the fear people had of this being a PvP-oriented expansion. It’s also one of the reasons why we’ve moved to a new world PvP mode. Whether or not you want to PvP out in the world should be an option that’s not based on server choices you made years ago because of the friends that you had at the time. We do get a lot of complaints from players saying, ‘I’m just trying to level up and I hate it when a high-level player swoops down and just ganks me’, while at the same time we get PvP players who say, ‘This is so cool, the world’s not a safe place, and it’s neat that I can go out and just battle with another player’. So we thought, ‘OK, we’ll give you the option’. You’ll get rewards if you choose to participate in PvP, but we don’t want to make that the right way to play the game. We’ve also been more conscious and careful about any racial benefits so that we don’t cause an imbalance between the factions. Have you learned any lessons from past expansions, and how have you implemented that this time around? For the way that we structure our quests, we try to keep them engaging and avoid any repetition of quest types. We also try to give you choice, as that’s something players enjoy quite a bit. I think the scaling that we did for Legion is something we’re very happy with, and that’s why we employed that throughout the entire game. I think players like going back and playing through some of that old content, and that there can be a level difference between them and their friends but they can still enjoy the content together. We have done some work to make that whole level up experience more fun. It’s certainly more challenging now – it had gotten to a point where it wasn’t very challenging at all – and I think people are enjoying that. We’re giving reasons to go back and play characters from level one, players have rewards for doing that now, and that fits into the theme of going out and acquiring allied races to help in your struggle against the enemy faction. Touching on Allied Races, the nature of creating a whole new playable race for one side or the other is inevitably going to spark a debate over which side has it better, or why a certain race has chosen a particular side – was that the goal? I don’t know that we were trying to cause a debate, but it’s inevitable that it was going to happen. You see a character that you really like and think, ‘Why can’t that be Alliance?’, and vice-versa for the Horde, but that’s part of what gives those factions their excitement and charm. We want people to pick a side or a race that they identify with – that they want to be them in this world. And who knows, that may actually result in players changing factions, or at least rolling a second toon on the opposite side. Obviously, Allied Races is one of the features players are very excited about for the upcoming expansion. How much thought goes into which Allied Race is next, and what side they go on? So first we looked at the geography of the space and who the inhabitants were. In some cases we drew from the lore that’s out there – it’s obvious who’s in Zandalar, for example – but in other cases, we had to think about what an interesting race would be to inhabit that area, and in some cases we had to think about inventing a new race to suit it. Then we consider what’s their natural tendency – are they likely to be more sympathetic to the Horde or the Alliance? – and then if we noticed a preponderance of really big, tough-looking races on one side or really charming, cool, cute-looking races on the other, then we try to do a little bit of a rebalance. Those profiles and those aesthetics are really important. We didn’t want everyone on the Horde to look ugly, right? And the order that we’re putting them out really depends on how the story unfolds. Early on we envisioned that the Zandalari Trolls might be something that we would roll out even ahead of the expansion release, but we thought actually you’ve not gone through the storylines yet, you haven’t earned their trust and respect, so it didn’t make sense to have them available to you. We wanted people to have early access to some races as we thought it’d be a cool way to get into the feel of what BfA is all about. We also think it’s important as our current expansion is starting to wind down that there are still things for people to do, and so that’s why we chose some of the Legion races as Allied Races for people to level up. People are already discussing the potential for races that haven’t even been announced. What’s the long-term plan? We have it all planned out. It’s certainly possible come year-end that we might make some changes based on what we’ve learned and what we’ve seen, but we definitely have a plan. But y’know, for some of this stuff it’s hard to keep it from our players once we’ve uploaded the data. They’re pretty good at trying to datamine what’s out there. What’s funny though is that sometimes we’ll put some of this data out, but without the intention of immediately unlocking it. Sometimes we get in trouble for that – when fans see it, they see it in some kind of encrypted form. They’re positive that it’s going to go live really soon, and can get a bit disappointed when it doesn’t. In our case, it was just a case of it being convenient and smart to upload the data at that point in time as groundwork. So we’re usually pretty careful about saying in the patch notes what players will actually see in the patch, so they know it’s intentional and not an accident or some hidden quest. Do you enjoy seeing these discussions? Oh yeah, definitely, it’s actually a lot of fun. There are even cases of people speculating about something they’ve seen in Hearthstone and being positive it’ll pop up in WoW. But you know, sometimes the chatter influences us itself. The decision to put in Dark Iron Dwarves was very much based on players saying for years that they’ve wanted to play that particular look of dwarf, and have been very disappointed that we never gave it to them. And the same with the Mag’har Orcs? Yeah, just people wanting more variety in orcs, for sure. But I honestly can’t remember the genesis of the decision to include all the orc tribes. We knew that we wanted to do more of an upright orc, but at the end of the day, some of the individual personality traits of the various orc clans in Warlords are not that distinguishable when you’re armoured up – especially when you have the new armour that you get in a new expansion – so we arrived at the idea of making an amalgam of all these different clans. We have Dark Irons, but what about the last remaining dwarf clan, the Wildhammers? It’s always possible, but we don’t have any immediate plans to include the Wildhammer clan. You mentioned faction-specific content and how BfA has the most faction-specific content of any expansion. How tricky is it to ensure players on both sides have a positive experience and one that’s equally enjoyable? We have two members of our design team with a responsibility for the storyline for their particular faction. They sit with each other and communicate with each other on a daily basis. Of course, there’s some degree of one-upmanship that happens within our design team, but I think they’re very conscious of that and want to make sure there’s a steady balance. But we also don’t want to take an idea that’s on the Horde side and just duplicate it for the Alliance side, we want factions to have their own unique flavour, and want our designers to feel they have some agency to craft the stories themselves. And at the end of the day, we play the game. I think the team has played both Legion and this expansion more than any of the work in the past. A lot of it comes from the way that we’re now building the game. In the past a lot of the stuff would come together fairly late, so we would get to see the work integrated into the game at around the same time that players would when we go to alpha. 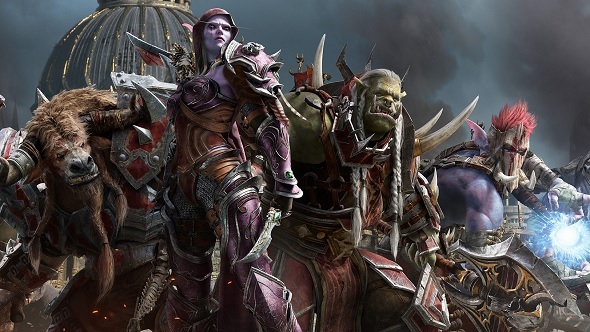 But now we’re seeing the content way, way in advance of that, and that means there’s plenty of opportunities for us to catch things like the Alliance not having a particularly cool feature, or the pacing being weak on the Horde side. The fact that we can do this earlier on without having to do a lot of rework is important, and that’s been one of the things that’s been great in helping us turn out more content more frequently, and to create more content than we have in the past. We can do more upfront planning than we have before. Most players have at least a few characters on both sides, but do you think it’s a risk separating the content out between factions in such a large way? Well, it’s not like we’ve reduced the amount of content you’re going to play! If you only play Alliance, for example, you’re going to feel as though the game is as big and as rich as it did when you played Legion. If anything we’re creating more content, it’s just you might not see all of it if you only play one side. But we thought that that’s okay, it’s what gives a faction part of its identity – the stories you can tell your fellow faction members that only they will know about, understand, laugh about, etc. Inevitably, there has to be a winner and a loser. How will you ensure that players on the losing side don’t feel hard-done-by? Well again, we’re not going to tell you how this all ends! There are going to be individual scenarios and battles where there’s a winner and a loser for sure, but those are the battles and not the war. We’re being very careful come the end of this that you’re not going to feel like you’ve chosen the wrong faction and that you’re with the losing side. But there will be times where you certainly have to pick yourself back out of the dust and prepare for the next battle. But that’s part of what’s going to create the tension between your faction and the opposing side.